I know how much all of you love Diamond Candles. Everyone loves the scent of a freshly lit candle and Casandra's Reviews and Giveaways is giving you the chance to win one of whatever scent you would like! With Christmas right around the corner it would make a great gift as well. Not only is it a highly scented candle there is also a ring in it worth anywhere from $10 to $5,000! This giveaway wouldn't have been possible without the wonderful bloggers helping me spread the word. Be sure to like their Facebook pages and follow them on Twitter! 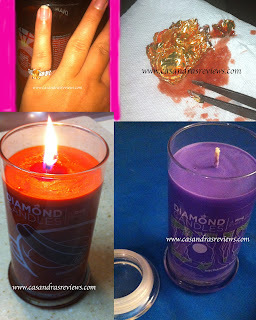 To see Casandra's Reviews and Giveaways review on Diamond Candles click here. The winner will have 48 hours once Casandra's Reviews and Giveaways has selected them to respond by email. The winner must be a live in the Continental USA! Be sure to add info@casandrasreviews.com to your safe sender list! Good luck! Casandra's Reviews and Giveaways is responsible for picking the winner and she is responsible for prize fulfillment. The bloggers helping to share the giveaway are in no way liable for the prize. They are just sharing the opportunity with you. For any questions regarding Casandra's Reviews and Giveaways participation in the giveaway email info@casandrasreviews.com.